Bgcolor='#FFFFFF' valign='top'>. 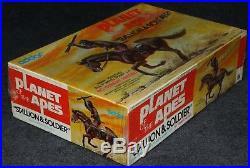 Aurora Model Era 1973 Addar Planet of the Apes Stallion & Soldier Factory Sealed. Note: We hold exclusive rights to our pictures! Clearly not without it's issues - Box look great - can't see any issues. But cello has a large tear in the corner rear - and one in the front from a price tag removal. Good luck finding one of these sealed any time soon - as scarce as sealed 1960's Universal Monsters long boxes! We strive to provide an accurate description of all items. Look at the large pictures provided. Also, please be aware that close up pictures might emphasize dust and minor imperfections that you won't see with the naked eye. Most of our items are from 30 to 50 years old and will have some degree of stress cracks, crazing, etc. We do not highlight'typical wear' unless we feel it is out of the norm. Additionally, wires get brittle, rubber dry rots, strings get frail. Battery operated items stop working. We will always tell you the operability of items in our possession - but we cannot, in any way, offer any guarantees of their continued operability. FUN FACTS, HISTORY, ATTRIBUTES (ie size, year of production, color, scarcity, etc). WHAT FOLLOWS HAS NOTHING TO DO WITH ANYTHING SPECIFIC in this listing. The story goes that many of the Aurora (THE definitive character model kit producing company of the 1950's, 1960's and 1st half of the 1970s) staff left shortly after Aurora was acquired by Nabisco and major management changes were made. Many of these ex-Aurora employees would start the Addar company. Addar started off on the right foot when they acquired the licensing rights to the Planet of the Apes movies. This listing is for an all original, Stallion and Soldier. 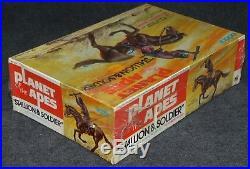 So much rarer than Addar's other Planet of the Apes models that many collectors are surprised when they see one! L & L Collectables is a small, family run business. Please see our'about me' page for more about us. Please review our policies below. Personal cks are held up to 10-15 days to clear. The cheapest option does NOT always show up first so please look at different options. Please request invoice (or it will cost you a little more). We've met many people through the years and many have become our dearest friends. Your business is important and valuable to us. Please do not ask us to put down a false amount or classify as a gift. The items we sell are vintage collectables so expect natural aging/wear. However, we will consider return if there was a significant oversight in listing. 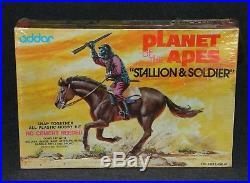 The item "Aurora Model Era 1973 Addar Planet of the Apes Stallion & Soldier Factory Sealed" is in sale since Wednesday, August 22, 2018. This item is in the category "Toys & Hobbies\Models & Kits\Science Fiction\Other Sci-Fi Models & Kits". 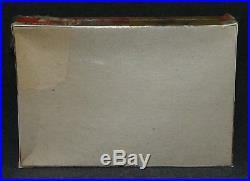 The seller is "landlcollectables1" and is located in San Jose, California.